This is a short story.Plzz comment on it. Rosmerry was 12 years old when her mother died.She was very innocent girl.Her father always remains busy in his work and did not pay attention towards his daughter.One day, he was working in his office,her client came.She was very beautiful woman.She called Rosmerry's father as JAMY because his name was JAMES.James liked that woman and married her after a week.That woman named LILLYwas very strict.She treated rosmerry like a servant.Rosmerry has been treated like a servant for 5 years but her father was not known about lilly's strictness because James spent most of his time in his office and after that with lilly.Jame's best friend advised him to stay with his daughter as well but always lilly was in his mind as his hairs. ''WHAT I HAVE DONE THAT YOU TREAT ME LIKE A DONKEY''? said rosmerry. ''You have done nothing but your fault is that you are not my daughter.You are daughter of that ugly woman but now you are only my servant.hahaha. ''said lilly. ''I will show you who is the best.Lets wait and watch. ''said rosmerry in her heart. ME''?????????? ?.James said yes you.At 8 0'clock they are coming. ''SEE YOU LATER''said James. Rosmerry laughed in her heart and was very happy to see lilly's face.Lilly prepared dishes.James came and tasted the dishes.Some dishes were salty and some were so spicy.James was very angry and shocked to see that lilly don't knew how to cook.Lilly felt ashamed and said sorry to James but he did not want to listen anything at that time.Rosmerry told her father that his clients had arrived.Rosmerry said to his father ''Don't worry my father! I know how to cook.My mother gave me a diary where all the recipes were written.She gave me this diary when I was 10 years old.I will prepare all the dishes.your clients are waiting,talk to them untill I return''. Lilly was very sad and did not say anything at that time.Rosmerry prepared delicious dishes and served to the clients.The clients were very happy to ate such delicious dishes.After an hour,when clients left from home,James gave a big hug to rosmerry and said,''I have spent my all time with lilly but in return what lilly had given me?but my daughter to whom I did not pay attention,she had helped me alot''. James asked to lilly to leave the house and went to the room.Rosmerry said to lilly ''WHO IS THE BEST''? Lilly shouted with anger,''YES,YOU ARE THE BEST.YOU ARE THE best!!!!!!!!!!!!!!!!!!!!!!!!!!!!!!!!!!!!!!!!!!!!''. 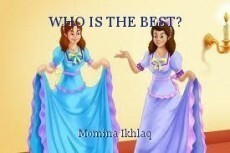 Lilly went back to her home.Rosmerry with a very happy mood,shouted,''WHO IS THE BEST''? SAY EVERYONE;I AM THE BEST,I AM THE BEST!!!. © Copyright 2019 Momina Khan. All rights reserved. that is so good and most of all that it perfectly matches with the title.I like no I love it.Wish you a very good luck for your rest of stories. THANK YOU FOR APPRECIATING ME, MY LOVELY FRIEND. try to write any story. This is pretty good so far ! I liked it too much, wish you the best of luck for your other stories ! This page was created in 0.3393 seconds.